Yeshiva University students and alumni from across the University’s many Judaic studies programs and around the globe came together on Tuesday to celebrate their historic siyum on Masechet Kiddushin. 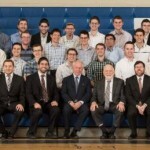 More than 100 students completed the masechta together, including undergraduates, students at the Rabbi Isaac Elchanan Theological Seminary, students in the Gruss Kollel in Israel, alumni – and MTA students – who have continued their regular learning in the Jacob and Dreizel Glueck Center for Jewish Study, making the siyum the largest in Yeshiva University history. We are proud that close to 30% of the mesaymim are from MTA, including 6 of the mesaymim who are current MTA talmidim.